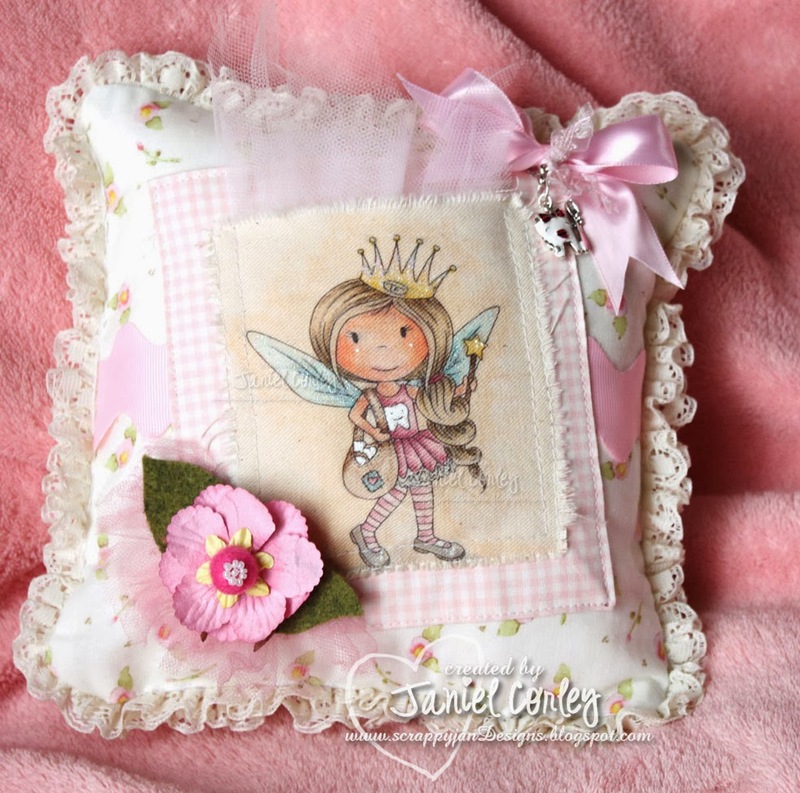 TOOTH FAIRY PILLOW with Tooth Fairy Alvery. Did you know that today is National Tooth Fairy Day?? I truly had no idea until Christine said she did a special image for it. Look at this little cutie!! I have made a tooth pocket pillow with it. VERY FUN and a CUTE way to put children's teeth in. I have used canvas to color the image on with my copic markers. 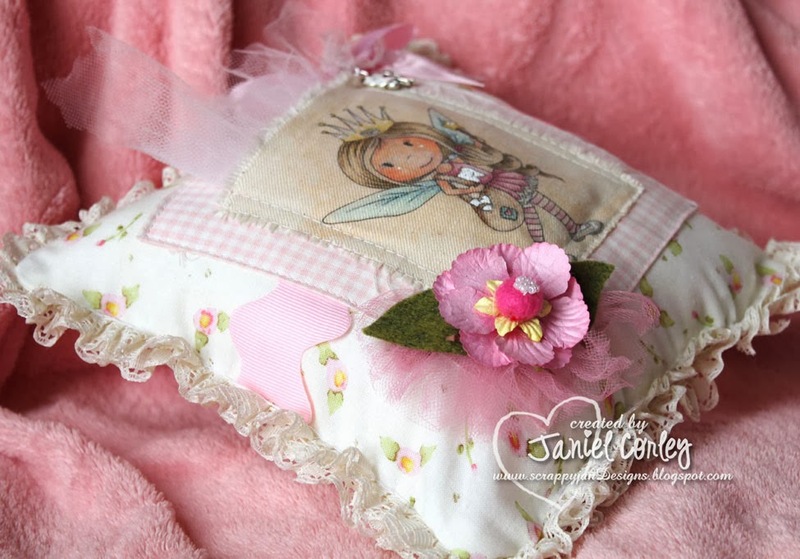 I have used my sewing machine to create my fun little pillow. With lace around the outside edge and big pink ric rac in the middle. 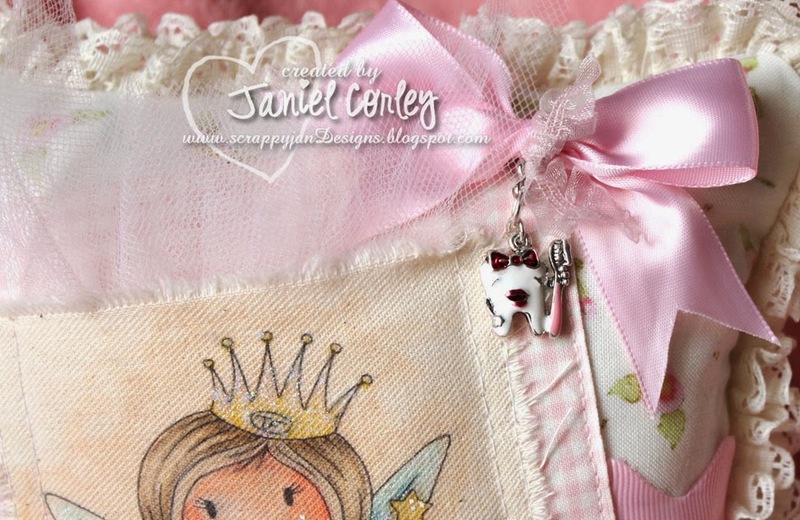 I have added a satin bow at the top right with a cute little tooth with tooth brush charm. Paper a felt flower on bottom right. 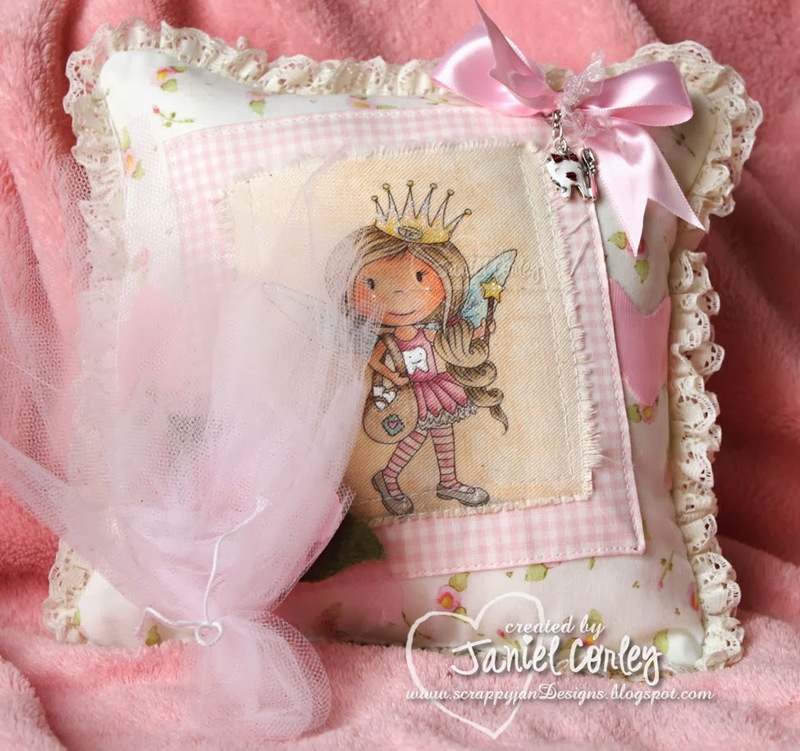 In the next photo you will see that the tulle can be pulled out of the pocket and the tooth tied into it so that the tooth fairy can get the tooth out easier!!! CLEVER HUH?? Close up of the fun charm. 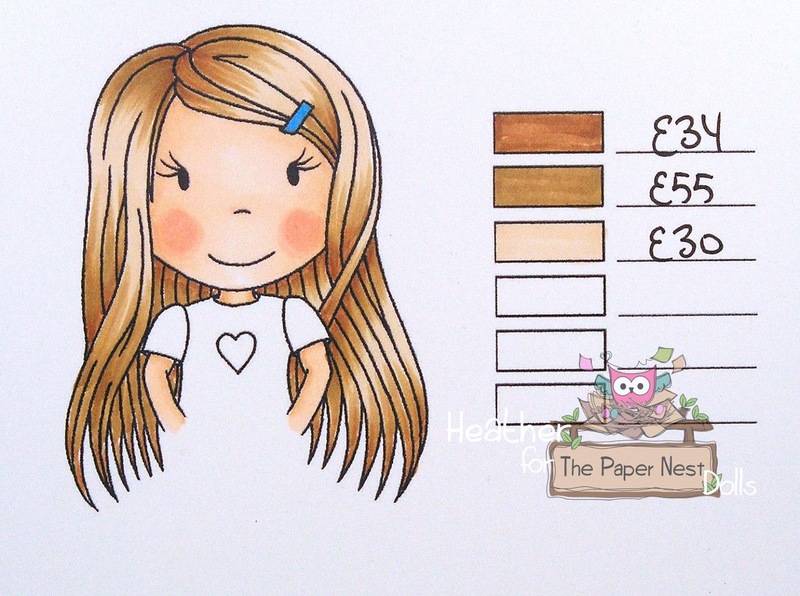 Would you like to win this cute little stamp?? If so please hop over to MY BLOG and and scroll to the bottom of post to find out how to win!! I will draw the random winner March 7, 2014 and post to my blog. 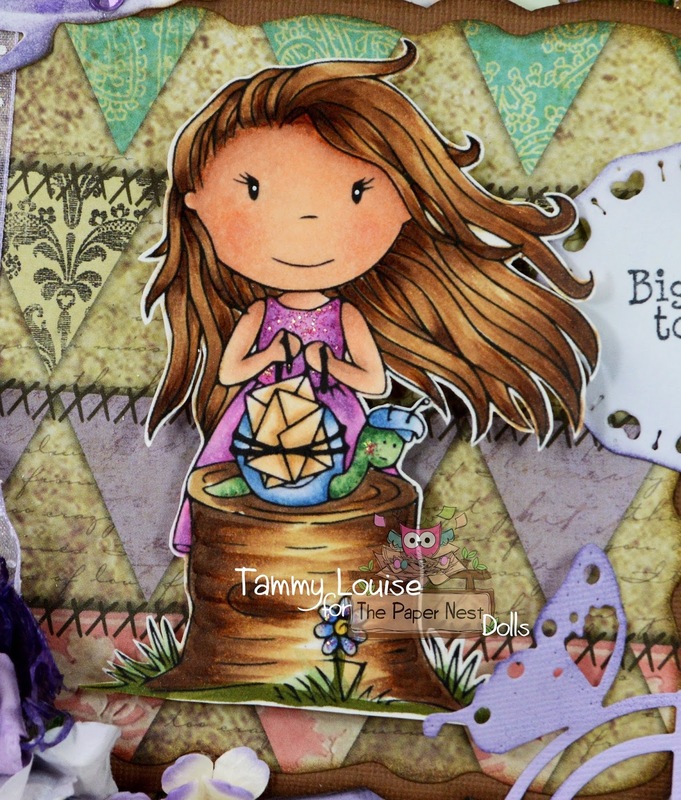 Tomorrow is The Paper Nest March Release Blog Hop. I hope you will stop back right here tomorrow morning and hop with us!! Thank you for stopping by today!!! 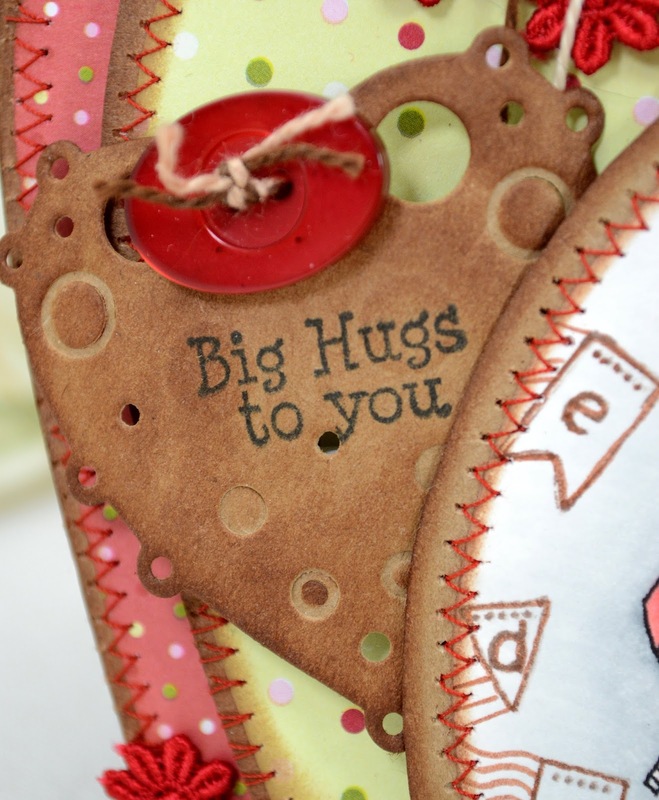 Howdy all you letter loving crafty friends! 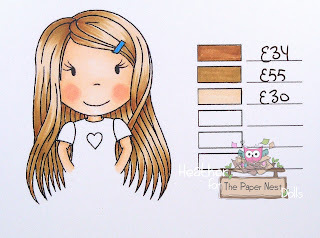 It's Tammy Louise here today and I've colored up Snail Mail Ellie Rubber Stamp by Paper Nest Dolls! Isn't she just ready to deliver you some friendly hugs! I decorated a notebook I found in the dollar bin at Hobby Lobby for my Neice! She's writing up a storm and even writes songs! I thought she would love little Ellie with her snail and pack of mail! 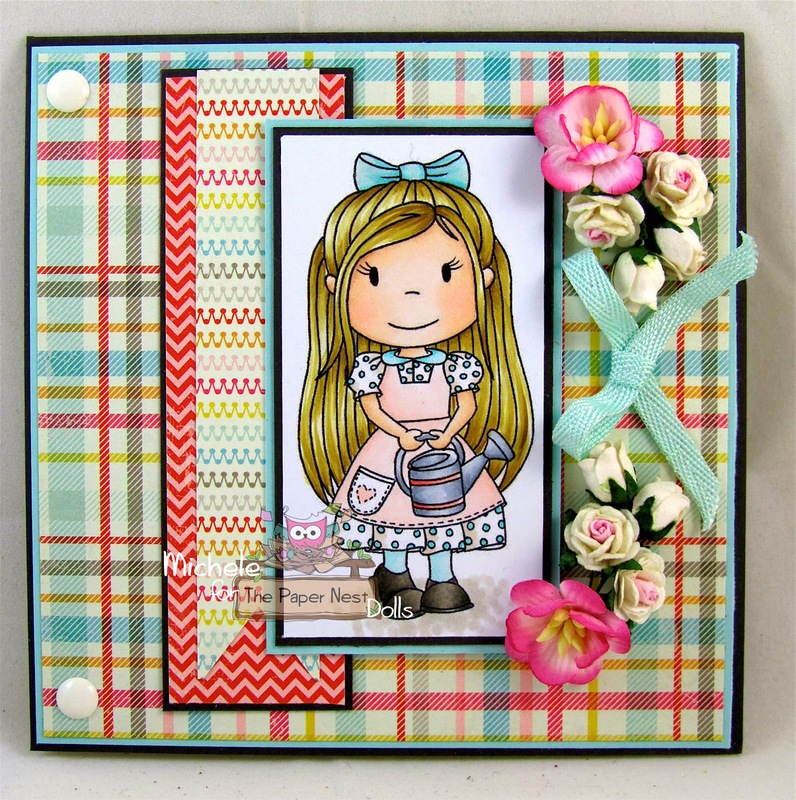 Above is one of my very favorite die designs of the New Release at CHA. 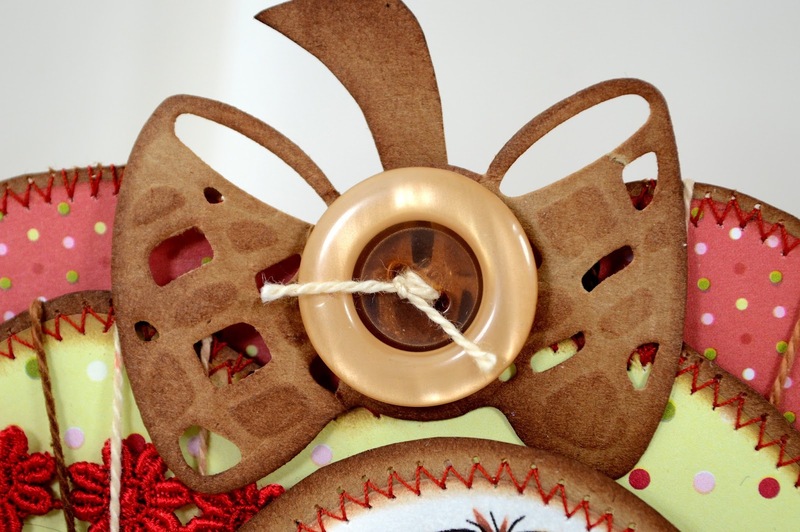 Soon it will be ready for pre order: Butterfly Friend Die from the Paper Nest Dolls! Don't miss out on your friend, it has a fairly new ability to deboss into the paper so you can distress, glitter and much more to make your paper stand out even more like I have in today's project! other little ingredients include: Little Darlings Rubber Stamp Sentiment, Lovely View Die, Darling Square Set die, Vintage Bike, and a great note book from the dollar store! If you want to see some more photos and check out some of my new favorite frames and such from Fotor and more links and lists of the ingredients! Stop by and visit! HandmadebyTLC. 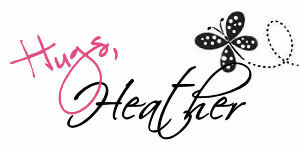 Hey everyone Heather here from Heather's Hobbie Haven. How about another light brown this week. how many does that make? I color from dark to light, but if you color from light to dark that's great to. See you next Tuesday with another hair color! 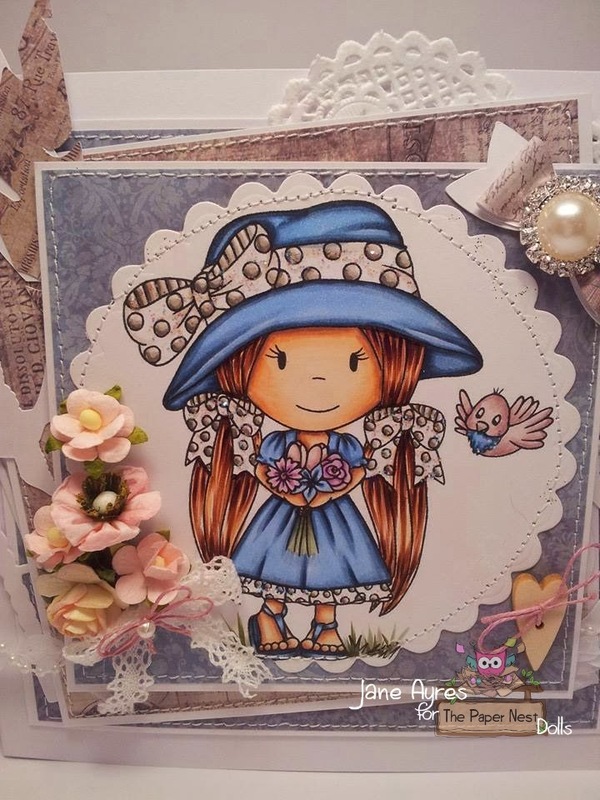 Hi there it`s Eva who`s here today:-) I`m going to show you a card I made some time ago using Aristocrat Emma, I love her, she`s really a cutie pie, and I have colored her up with copic, and put her on an easel card. 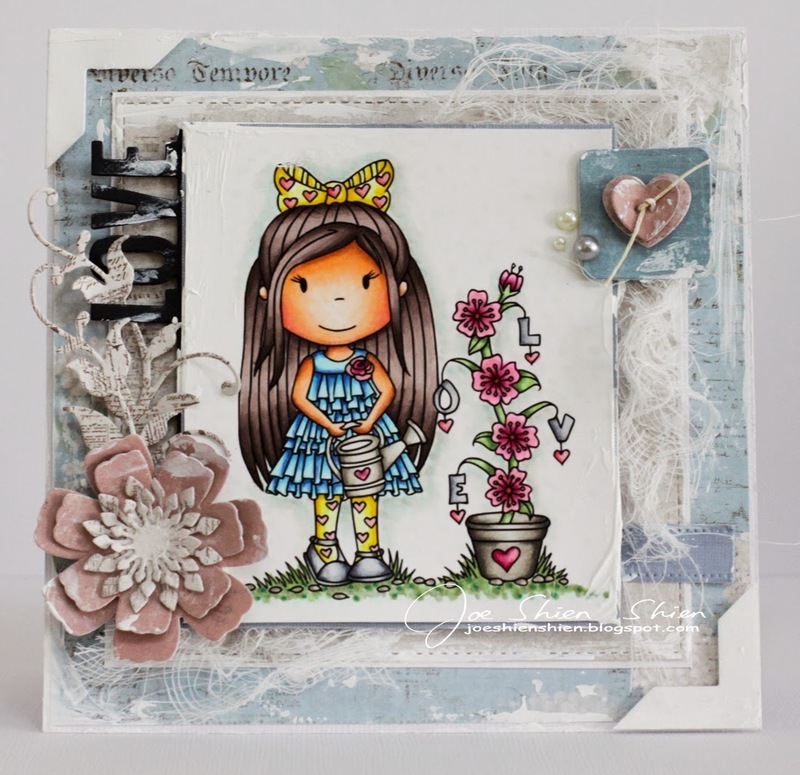 Dies used are from Spellbinder, Marianne Design, sissix and Magnolia. 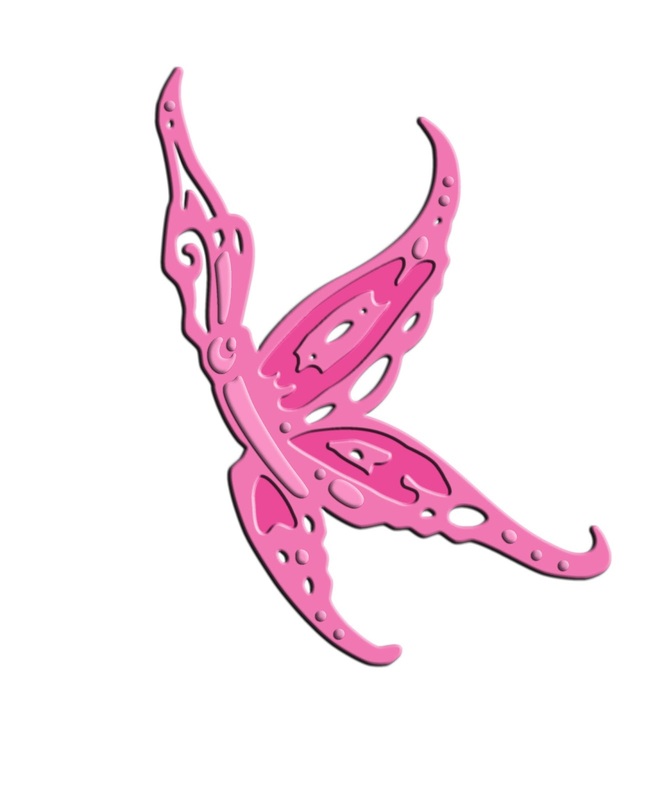 Butterfly punches are from Martha Stewart. Valerie here today, and I have a completely different one for you! I'm using the fun & spunky Punk Ellie; isn't she so precious?! 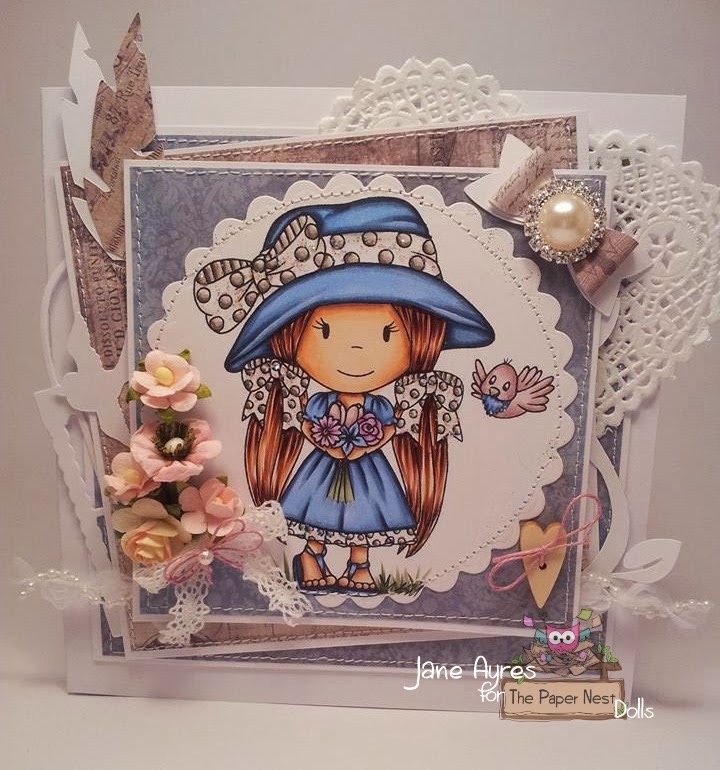 This is a smaller card, than I'm used to using for my Paper Nest Dolls cards, an A2, but it worked out perfectly for all the floating hearts. 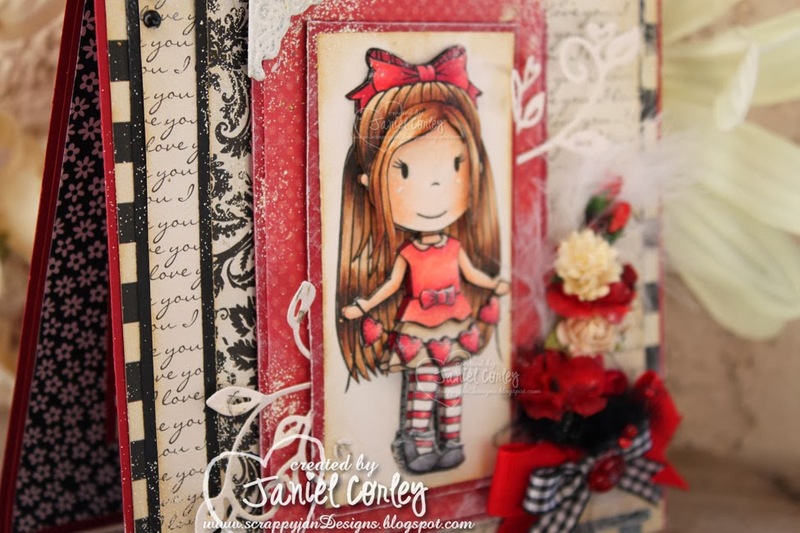 You can find many more images of this fun card, and supplies I used, on my blog, ValByDesign. Have a wonderful weekend, and Happy Crafting! 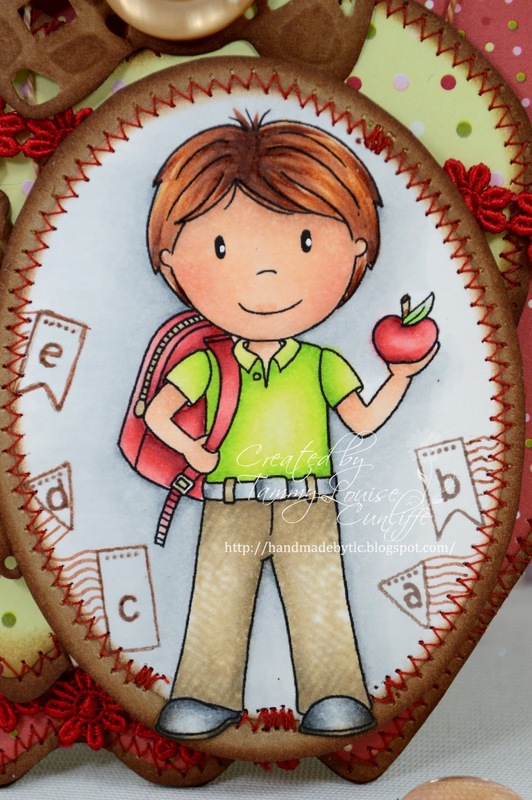 This cute little guy would be perfect for saying Hi, Thank You or just Have A Happy Apple Day to your favorite teacher of anyone needing a little lift! 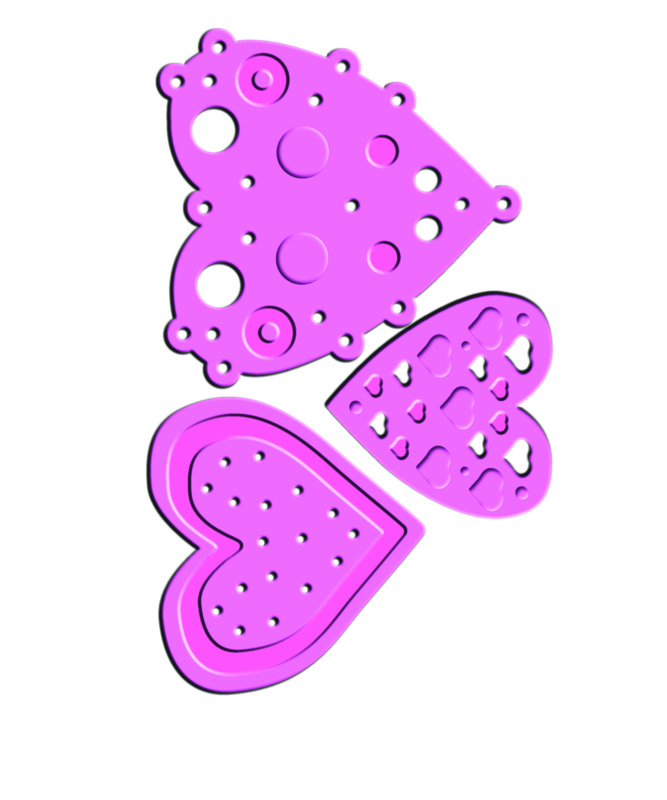 The Apple template is one of my Shape EZ templates you can create with too. They all come in JPEG, PNG, PDF and SVG files so you can use in a cutting machine or run through your printer like a digital image and hand cut. I've used design paper by Colorbok from Walmart by Heidi Grace designs and some Kraft Paper today and distressed with Ranger Distress Ink. 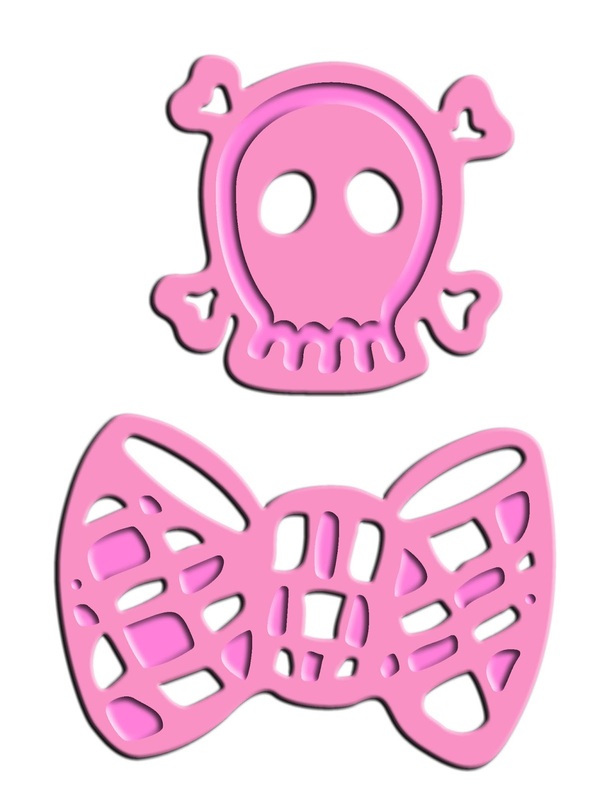 Played again today with some of the terrific Paper Nest Dies soon available in the store called Punky Skull and Bow Die and the Heart Felt Trio. Some of the little extras include Buttons Galore and More Cherries Jubilee and Latte buttons and Prism Craft Thread. Ribbons from Joann Fabrics and the Sentiment set used is "Use your Words" from the Little Darlings Rubber Stamps Store. I colored Owen in Copic ink, the Red is R32,35,37, the skin tones are E00,E21,E13, E93,E95 and the yellows are YG000,YG01,03. Hope you enjoyed the share, I've been playing with my favorite new photo frame/edit program again so you can see more photos on my blog above and there will be a link to my Etsy store where the template is available for purchase as well. 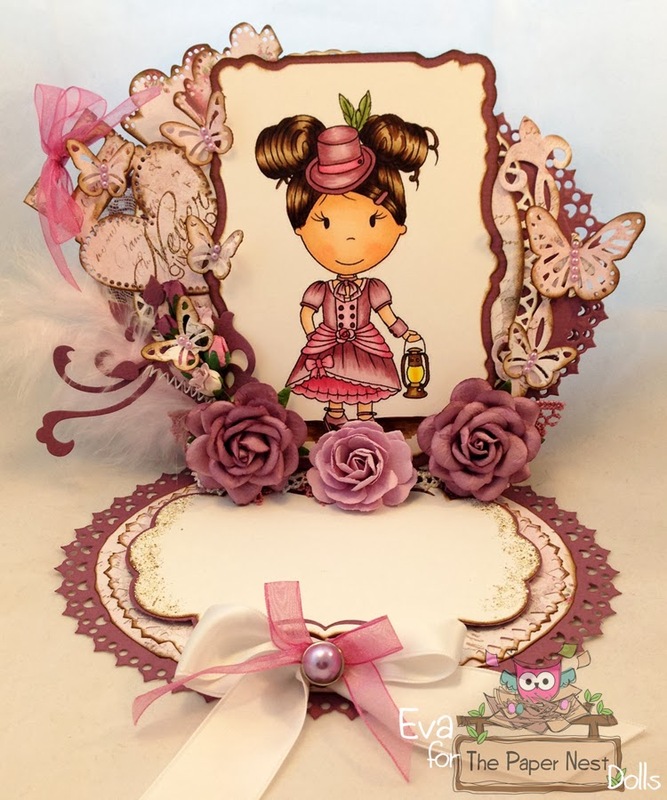 Such a cute invite to a little girls tea party don't you think?!?! Hope you liked my little invite .. may have to have a little tea party as an excuse to make more! 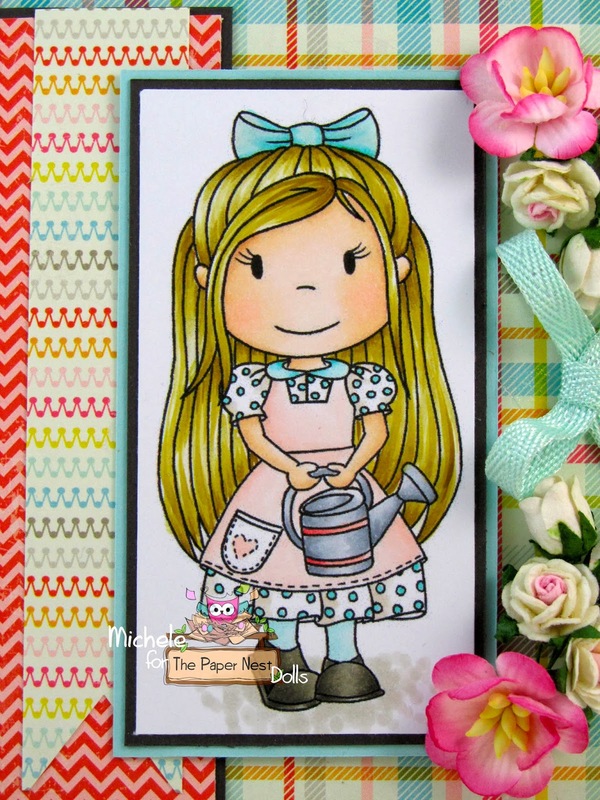 Hello it's Patricia here and it's my turn to host The Papers Nest Dolls Inspirations Blog and I am sharing this card using the image Shamrock Ellie, isn't she just adorable, I think she's perfect for a St. Patty's day card, Good Luck card too!!! Colored with Copic Markers, Love the 3 leaf clovers too!! 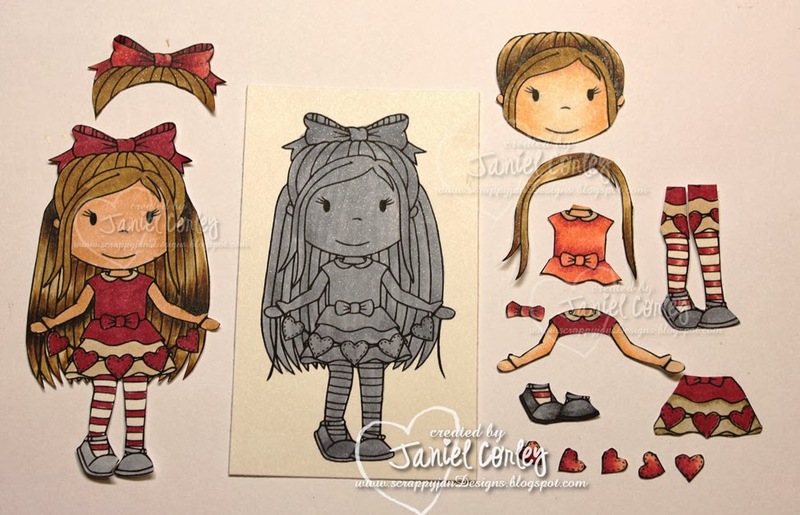 The Paper Nest Dolls Has lots of fun images for every occasion, I love the way Christine draws the cute little girls dressed up. Please check out her shop HERE so you can see all the amazing images she offers perfect for your celebration needs!! 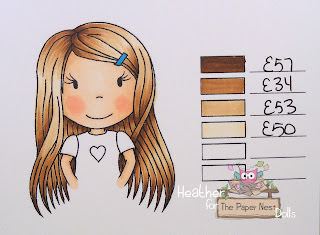 How about a light brown this week. I'm working on making Christmas cards. I have to make some each month, so that I will have enough when it comes time for Christmas. I have great joy making Christmas cards. The rubber stamp I have used is Elf Ellie. Today I wanted to share a project made by Jill Hansen. 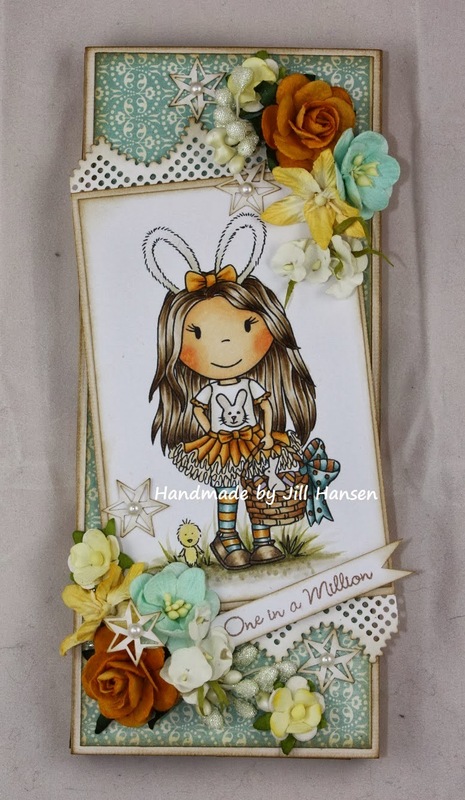 This is your first peek at one of Paper Nest Dolls NEW stamps coming out March 1st.....Easter Bunny Ellie . Jill made this sweet little box to hold chocolate...I just love it. Be sure to stop by her blog HERE she has a hop going on, and March 1st come back here to see all the new cuties being released. Hello everyone... Happy Valentine's Day!!! 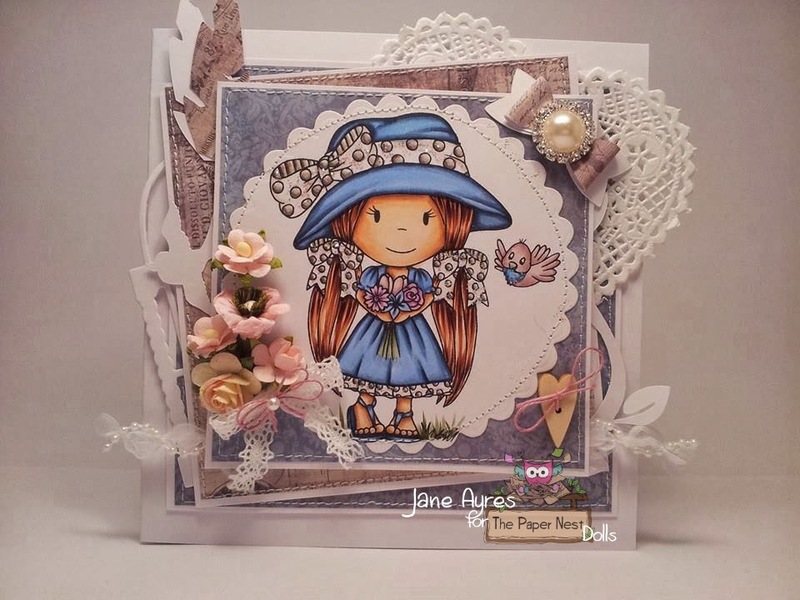 Janiel here today and I have a very cute card to share with you. I have used and colored Love Strung Ellie with my copic markers. I have done her in paper tole and think she is adorable!! Papers used: Scraps from my drawer. 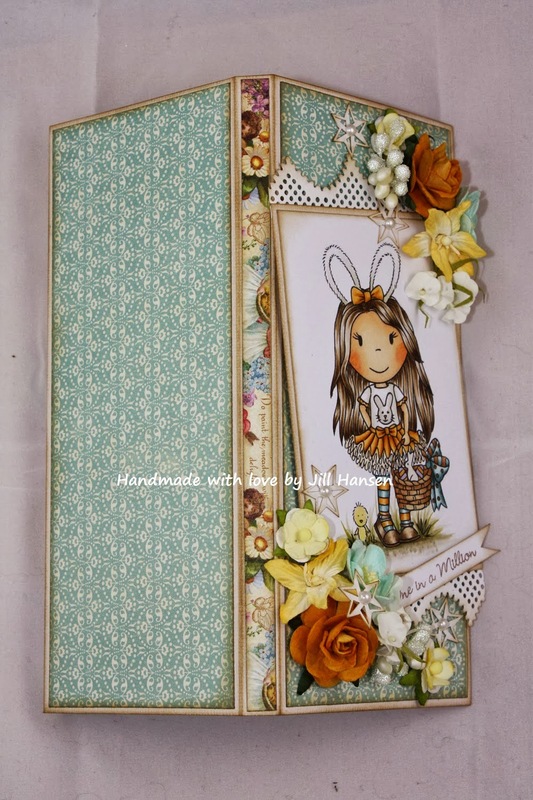 Embellies: pearls, 2 ribbons, flowers, feathers, metal photo corners with Gesso on it. glass heart. Dies: Magnolia Heart swirl available at Magnolia-licious. A look at the pieces before I put them all together. If you do please hop over to my blog and leave me a comment. I will draw a winner next Wednesday February 19, 2014 and post to my blog. Janiel's blog MY LITTLE PIECES OF ART click HERE.